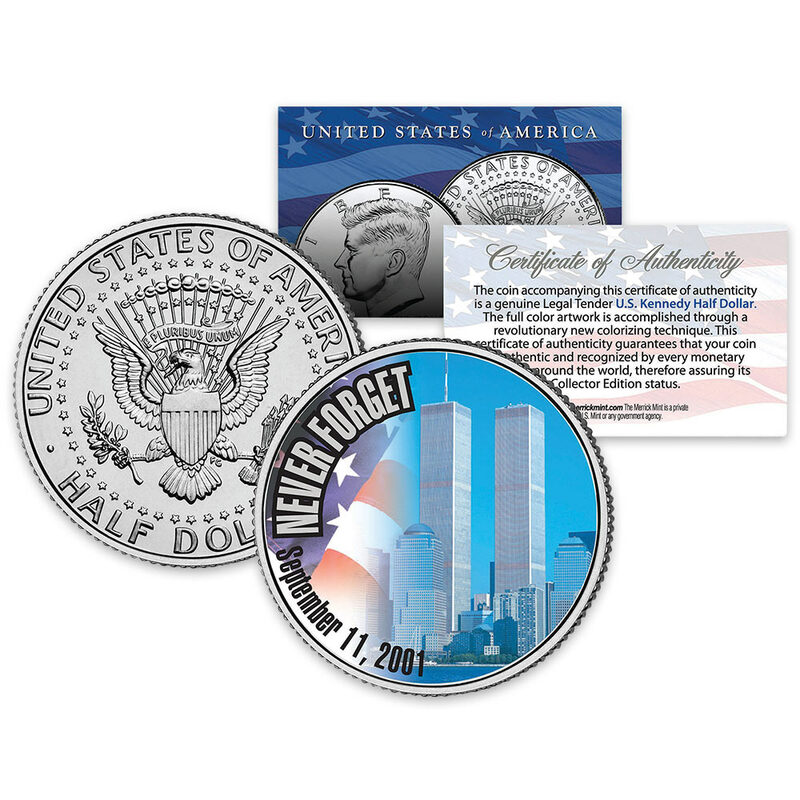 9/11 "Never Forget" World Trade Center Colorized 2001 JFK Half Dollar | BUDK.com - Knives & Swords At The Lowest Prices! 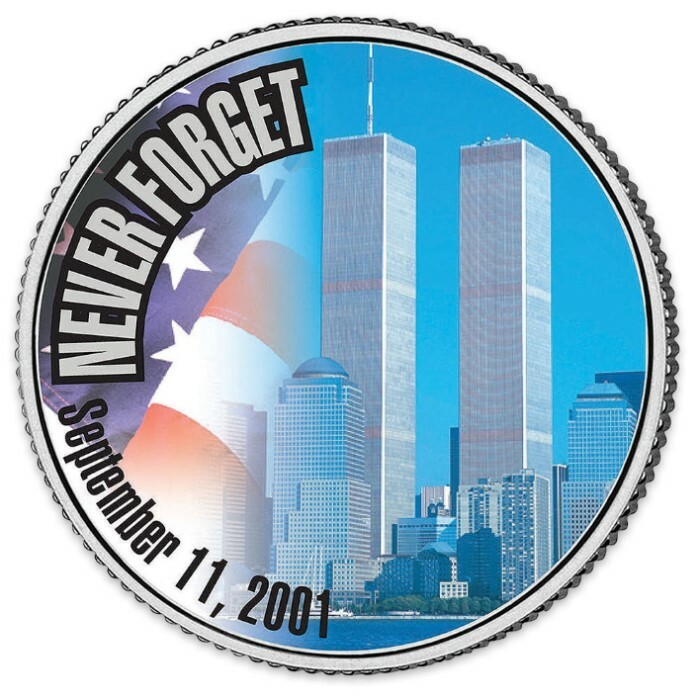 You don't have to be an avid coin collector to appreciate this stunning 2001 JFK half dollar, featuring a vibrantly colored photo-quality image of the iconic pre-9/11 World Trade Center "Twin Towers" on the coin's head. The stately towers are flanked by the red, white and blue stars and stripes of the US flag and the poignant words "NEVER FORGET; September 11, 2001." Whether you're a coin collector or just a proud American, this is your chance to own this extraordinary genuine legal tender 2001 half dollar, minted at the US Mint and brilliantly colorized via a unique multicolor process by the collectible coin experts at the Merrick Mint. Special inks are painstakingly applied directly to the surface of each coin, achieving a level of detail, color saturation and durability that is simply unrivaled in the collectible coin industry. Each coin comes in a premium transparent acrylic capsule that will protect this distinctive treasure for generations, making it a perfect family heirloom to be passed down proudly for decades - even centuries. 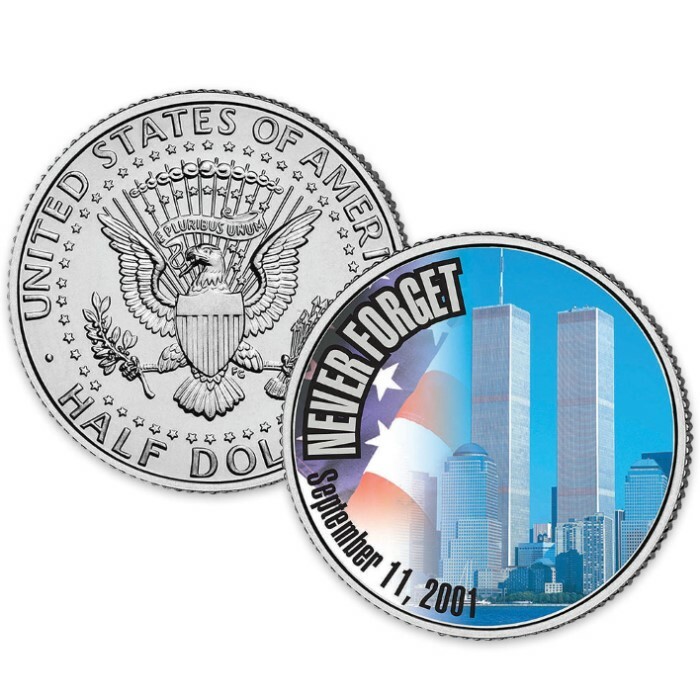 Makes a fantastic gift for coin collectors, 9/11 survivors, victims’ loved ones and proud patriots of all stripes. Includes a certificate of authenticity that asserts your coin's legal monetary recognition and collector's edition status. Each 2001 Kennedy half dollar is a United States 50 cent coin with mint marks chosen at random. Hurry! Supplies are extremely limited and we have one of the few stashes available.